Buried glaciers have been spotted on Mars, offering new hints about how much water may be accessible on the Red Planet and where it is located, researchers said Thursday. "Astronauts could essentially just go there with a bucket and a shovel and get all the water they need," said co-author Shane Byrne of the University of Arizona Lunar and Planetary Laboratory in Tucson. A total of eight ice sites, some as shallow as a few feet (one meter) below the surface, and going as deep as 100 meters or more, have been exposed by erosion. These underground cliffs, or scarps, appear "to be nearly pure ice," said the report. The discovery was possible due to images and data sent by the Mars Reconnaissance Orbiter (MRO), launched in 2005. The probe's first find of water on Mars was published in Science in 2010. But now, scientists realize that ice is more widespread than previously thought, said lead author Colin Dundas, a geologist at the US Geological Survey in Flagstaff, Arizona. "There is shallow ground ice under roughly a third of the Martian surface, which records the recent history of Mars," he said. "What we've seen here are cross-sections through the ice that give us a 3-D view with more detail than ever before." The ice contains bands and color variations that suggest it was formed layer by layer, perhaps as snow accumulated over time, leading to ice sheets. Researchers believe the ice formed relatively recently, because the sites appear smooth on the surface, unpocked by craters that would be formed by celestial debris smashing into the planet over time. But just how and when they formed remains unclear. The cliffs are located in the northern and southern hemispheres of Mars, at a latitude of 55 to 58 degrees, which on Earth would be similar to Scotland or the tip of South America. These regions slip into a frigid darkness during the Martian winter and would not be a suitable site for a long-term human camp. 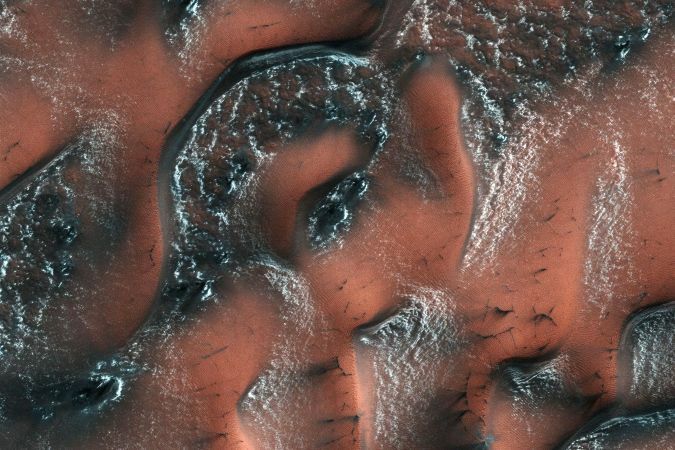 However, they are not as treacherous as the poles, and if a sample could be drilled from one of the glaciers, researchers could learn plenty about Mars' climate and the potential for life on Earth's neighboring planet. "If you had a mission at one of these sites, sampling the layers going down the scarp, you could get a detailed climate history of Mars," said MRO deputy project scientist Leslie Tamppari of NASA's Jet Propulsion Laboratory. "It's part of the whole story of what happens to water on Mars over time: Where does it go? When does ice accumulate? When does it recede?" NASA plans to send the first human explorers to Mars by the 2030s.